Authentic Eagles: Delia Karamouzis on Routines | BANG. I was sitting in an O’Neill study room at 11 p.m. on a Sunday night during my freshman year, finding new ways to procrastinate, when my friend Kalie shoved her iPhone into my hands, insisting, “You have to watch this.” It was a video entitled: “The Thousand Year Journey: From Oregon to Patagonia,” produced by a travel writer by the name of Jedidiah Jenkins. The video illustrated Jenkins’s journey upon quitting his job to ride his bike from, you guessed it, Oregon to Patagonia. I was immediately struck by the video’s simple, yet profound message: “The routine is the enemy of time, it makes it fly by. Once your brain establishes a routine, your alertness and fascination with [how] the world works goes away.” At the time, I don’t think I quite realized just how much that quote would impact me. But three years later, I still find myself going back to it. 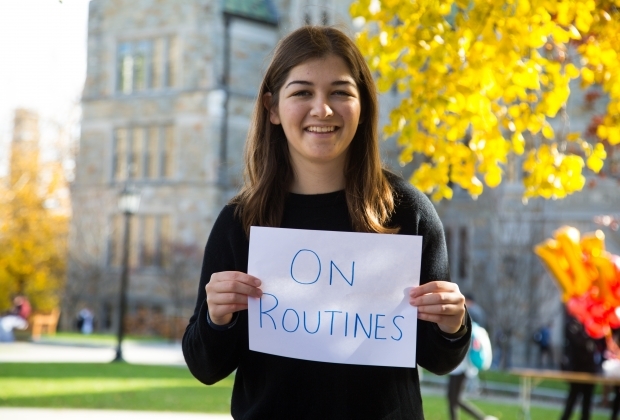 On a campus of passionate and ultra-involved people, our routines offer us a way to juggle the demands of classes, clubs, friends, and occasionally, sleep. I can tell you exactly what any given Monday usually looks like for me: Wake up at 7:45 a.m. (More likely 8:15 a.m. if we’re being realistic about how many times I snooze my alarm), get ready for class, and make a bowl of oatmeal for breakfast. By 10:15 a.m. I’m out the door for class from 10:30 – 11:45 a.m., and then I'm off to class again at noon. After class, I have an hour break to grab lunch from Eagles before I head over to Bapst to catch up on homework for the next day. On a good day, I make it to the Plex. From there, I head home to make dinner (or at least attempt to), and catch up with my roommates. Shower. Sleep. Wake up the next morning and do it all—or close to it—over again. I used to love my routine; I love the feeling of being settled and knowing exactly where I’m supposed to be and what I’m supposed to be doing. As I began my sophomore year, my routine was in full force. I felt like I had finally found my place at BC—I was living every BC sophomore’s dream in a Walsh 8-man, serving as a Trip Leader in Appa for the first time and participating in Arrupe. While my classes were more challenging, I felt secure in the group of friends I had around me and the activities I was involved in. It seemed like I was doing all of the “right” things. Despite this apparent security, I quickly found myself in a “sophomore slump.” I felt stuck in a culture that I wanted no part of: classes Monday to Friday, a pre-game Friday night before attending the same parties that consisted of the same people whom I didn’t feel particularly close with. Saturday morning meant waking up early to go to the football game with the same people from the night before, all culminating in homework and Appa on Sunday. To me, it seemed like everyone else was following a script they’d been handed, but I started to realize that the script just wasn’t for me. I found myself simply going through the motions—motions that I didn’t even like, much less ones that I chose for myself. It was incredibly frustrating to feel so unfulfilled with a routine that everyone else around me seemed to love, and I began to doubt myself. As a member of the Campus Ministry trifecta of Appa, Arrupe and Cura, and in typical BC fashion, I was constantly being asked to reflect on things. But the more I reflected, the more I realized that the day-to-day life I was living made me feel unhappy, lonely, and most of all trapped, and I hated that feeling. I knew that I had to channel my energy elsewhere and my safest and most logical option seemed to be school. As my courses grew more challenging, they demanded more from me and I cringed at the thought of not meeting the high expectations I set for myself. I thought that if I threw myself into school work, I could avoid this intense pressure I felt to be a part of something that just wasn’t me. By focusing on school, at least I would have some say in where I was spending my time, rather than having it imposed on me by “groupthink.” I began to isolate myself, skipping the things I was “expected” to participate in, like Friday night pre-games and 8-man meals at Lower. Focusing on school gave me an excuse to be out of my room and to avoid participation in this routine I had wearily adopted. But that wasn’t the answer either. I became overly-fixated on school and meeting the impossibly high standards I had set for myself. I trudged to class each morning, sleep deprived and increasingly anxious. I vividly recall sitting in Bapst one night agonizing over a paper for my Poli-Sci class due the next day. As I sat in my chair, I could physically feel the stress mounting as my shoulders began to tense. All of a sudden, my heart felt like it was beating out of my chest. I was short of breath. I’d never experienced anything like it before and I was so frightened. I immediately went outside to get some fresh air and like any strong, independent college student, call my mom for advice. Through our long conversation, I realized that this fixation I had developed with school was a coping mechanism: a way to avoid the toxic “sophomore routine” that I wanted no part of. I had become so wrapped up in abiding by this new, rigid routine that I’d forgotten to open my eyes to see the beauty that lived outside of it. In turn, I became someone I didn’t recognize and someone I certainly didn’t want to be. As the semester went on, I was more aware of the pressures I felt, and though I finished out the semester, things had only improved slightly. Over winter break, I traveled to Belize with the Arrupe Program. I won’t pretend like that experience solved all of my problems, but it was the first step in waking up to much of my "fascination" with the world that I was sorely lacking first semester. While in Belize, I stayed with a host family. Suddenly, my passions and intrigue were sparked as they graciously welcomed us into their home. Despite being far away from my routine at BC, I felt revived again. Now, I woke up each morning with no idea what the day would bring. As we explored Mayan ruins, met with local community leaders, and learned about the rich history of Garifuna culture, I suddenly felt like a kid again. Everything was new and fascinating. I was mesmerized by the breathtaking physical landscape around us and the people we met. As I spent time baking bread with my homestay mother and learning about her job as a teacher, I was reminded of the vast world that exists beyond BC, and outside of the routine that I felt so trapped within. Now, as a senior reflecting on what I want to do after I leave BC, I often try to examine the common threads of the things that I’ve spent my time here doing. What do I love about them? What ties them together? Looking back, I’ve come to realize that what ties my varied commitments together is the importance of dynamic experiences in each of them. I think of all the formative experiences I’ve had, the times when I’ve felt the most me have included playing mafia in the community center of a church in Elizabethtown, Kentucky on Appa, wandering through a cacao farm in rural Belize, and exploring ancient ruins while studying abroad in Greece. The dynamic experience characterizing each of these memories is what resonates most strongly with me about them today. In other words, the common thread has been the importance of seeing and experiencing new things each and every day. I find that I’m the happiest on the days when I wake up and have no idea what the day will hold. Fortunately, I've learned I don’t have to be halfway across the world for that happen. The best moments are the unplanned ones (spontaneously running into someone on the way to class or on line at the Rat) that change your whole day in the most positive way. The moments that keep that sense of “childlike wonder” alive in us can disrupt the monotony of the everyday routine. Often, I'll try to take a new route to class—a different staircase or a walk on CoRo instead of across the Quad—just to see who I’ll run into or how my day will change as a result. Making everyday a little different than the last—that’s how we grow. Don’t get me wrong, routines can be comforting and helpful; they provide us with structure. But they can also make us feel stuck. The dynamic parts of each day and the unknowns each day bring, that’s where I find my joy. Few things have stuck with me and made me think about the way I approach my own life more than that video I watched a while back on a random Sunday night in O’Neill. I return to it whenever I need a refresher, and I try to pass it along to those I think might benefit from its wisdom. I don’t know if I’d ever do anything as dramatic as quitting my job and riding a bike across South America (some days, going to spin at the Plex is too much effort), but I’ve realized that sometimes, we all need to shake up our routine.